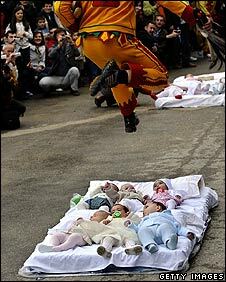 Jumpers dressed as the Colacho, a character representing the Devil, bounded over clusters of bemused infants laid out on mattresses. Nobody appeared to get hurt in this year's festive event. Castrillo, near Burgos, has been holding the event since 1620 to mark the Catholic feast of Corpus Christi. The feast is widely celebrated in Spain, often with processions and mystery plays. Pageants can feature dancers depicting demons and angels or other characters.